Eric Dendy has recruited experienced personal trainers who share his training philosophy and expand the diversity of fitness techniques used at LIFT. Eric has served as a personal trainer in the Lake Mary area for more than two decades. Eric opened the Lift studio in 2002 with a clear vision—to offer customized, sustainable, and affordable personal training services to individuals seeking to maximize their potential through fitness. Eric has trained and played sports throughout his life, so he understands how to optimize the training cycle in preparation for competition. Eric became intensely interested in developing his body’s potential as an undergraduate. During that time he competed cleanly in bodybuilding and was crowned Mr. Northeastern Colorado. After graduating with a degree in criminology, Eric moved to Florida to work in law enforcement before becoming a full-time personal trainer. He worked in area gyms for several years, but the prevailing philosophies didn’t satisfy him. 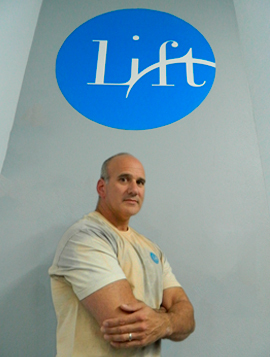 Eric founded LIFT with an emphasis on communication, accountability, and flexibility. He prides himself on being a good listener, and much of his knowledge comes from working with hundreds of long-term clients from widely diverse backgrounds. Eric’s personality and approach also foster teamwork among LIFT’s staff of professional trainers. Eric is a proud husband and father of two girls. He coaches youth soccer in Seminole county and follows his own training regimen five days a week.